You’ve never seen anything like this! With our 2019 trend catalogue, you’ll be receiving our new seasonal themed catalogue right at your door. Experience more about our early spring novelties and trending products from the small foot brand in this first edition and get your share of what’s guaranteed to be „in“ in the children’s room at the start of the year! You can also look forward to the upcoming themed catalogue with trending products for Easter and the outdoor season – this is how we’ll keep you up-to-date at all times. 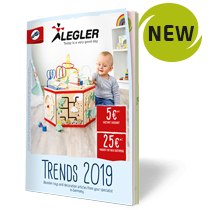 The 2019 Legler trend catalogue is stuffed with trends and products that are currently driving the toy industry. May we introduce you to our numerous new products and interesting product group expansions? Start a new season with us which will offer all kinds of opportunities for your business! „Active!“ – The new small foot outdoor series is bringing lots of movement and fresh power to your outdoor assortment! That means: play, fun, sport and action for both young and old combined with modern designs and trendy colours. Small foot’s new sales booster for the outdoor season promises just as much fun: with these toys, kids can be gardeners just like the grown-ups! For the youngest kids: Discover TÜV-inspected safety and babies‘ small foot favourites on the play mat with the baby toys in the Lotta, Lex and Ludwig product group. The series of interactive wooden picture books which train young children’s motor skills with lots of fun have also grown with three new themes: Construction Site (12039), Fire Brigade (12040) and Police (12041). Motor activities – Bestsellers for your success: Make space on your shelves for the Move it! motor activity multi-talents in trendy designs, the motor activity top-sellers with a wilderness look („Jungle“) and the motor activity classics which never fail to bring the fun – there’s something for everyone! A fresh breeze for role-playing! Come discover new and unique role-playing highlights for 2019 such as the lawn mower baby walker, the letter-box with accessories, the cash register with play money or the vegetable garden incl. play set. But that’s not enough: There’s also all kinds of new stuff for the role-playing segment including the play kitchen, play store and dolls which will make children’s eyes shine! Educate! learning toys: Educate means play, fun and the desire to learn, and enchants not only (pre-)schoolchildren. Stock up now for the start of school! Top themes: The farm and construction site out of the top drawer! You’ll be building sales success with the Woodfriends farm and its accessories as well as the new features for streets and construction sites in the children’s room … and the new large wooden construction vehicles such as the dump truck, the crane lorry and the bucket excavator! A little fun on big trips! Discover parlour games in a handy format for both big and small trips, and score more sales with classic games in a to-go format. Letters made of bamboo – Where trend meets creativity! Our new ABC letters are distinguished by their clear language of form and are therefore particularly suited for young novice readers. And here’s the best thing: Typographical décor is totally trendy! Combinable with the cute ABC letter monsters, these letters can also be used as part of a decorative door sign for the children’s room. Discover all new products and novelties in the online shop now! We’re looking forward to your order! you should receive the new catalogue within the next days. Please give me the catalogues. Hello! We haven’t had a copy of your new catalogue through yet. Could we request one please? Please send your 2019 Spring Trend Catalogue. Could I please request a copy of your catalogue at your earliest convenience.